This fall, Jana Fischback MES ’14 and Christen Cannon ’14 wrapped up internships that capped their Evergreen educations and laid the groundwork for promising futures. Fischback interned at Point Defiance Zoo and Aquarium, a 700-acre nonprofit facility of Metro Parks Tacoma, while Cannon interned at Intel, a publicly traded, global technology company. The two internships could be viewed as a study in contrasts. 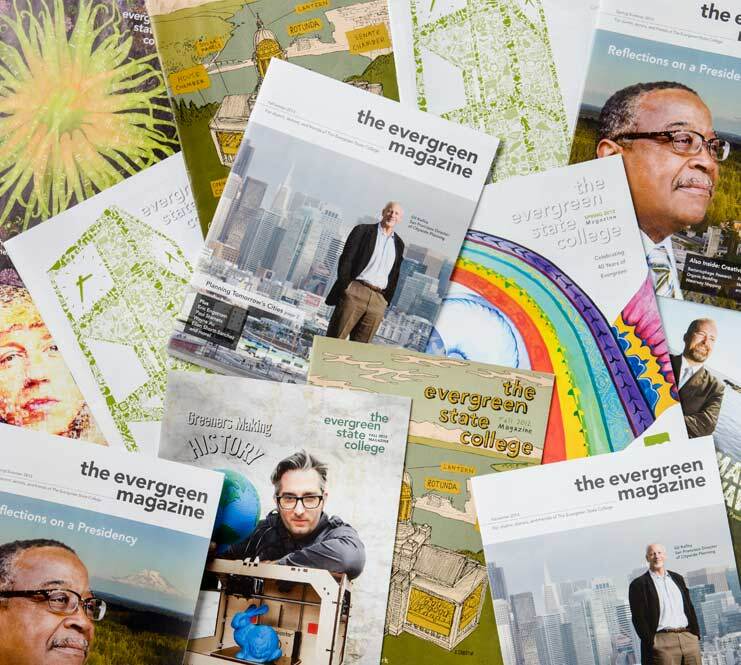 However, the vision, collaboration, and applied learning the two women demonstrated through their internships are woven into Evergreen’s culture and philosophy—and into their successes. Jana Fischback at Point Defiance Zoo in Tacoma. Photo by Shauna Bittle ’98. On a typical Wednesday at the Point Defiance Zoo and Aquarium (PDZA), sustainability coordinator Jana Fischback and a group of youth and adult volunteers climbed into big, blue protective suits and donned rubber gloves to sort through the 800 pounds of garbage gathered at PDZA in just one day. Their audit revealed that the day’s visitors recycled just half of their aluminum cans and one-third of their plastic water bottles. Fischback landed her internship with PDZA in June of 2014 and began work the first Monday after her graduation day. In consultation with the people who work behind the scenes, she spent the next three months writing a comprehensive sustainability plan for the zoo. “Why does one person toss their plastic beverage bottle into the garbage while another chooses the recycling bin? What motivates people to change their behavior and what are the barriers that keep them from changing? What concrete steps can we take to motivate change?” These are the kinds of questions Fischback researched while earning her Master of Environmental Studies (MES) degree at Evergreen—and addressed at PDZA. She emphasizes the importance of measurable steps, such as increasing the amount of composting in the café, installing water and electricity meters to better measure consumption, and adding more water-bottle filling stations to the grounds. “Initiatives that lead to real action, rather than just increasing awareness, are what I’m interested in. The zoo has great potential for making improvements, and has already done things such as switching 97 percent of the zoo’s incandescent holiday light bulbs to LED bulbs for the annual Zoo Lights display. That’s thousands of bulbs,” she said. Hummingbird on a strand of LED lights at the Point Defiance Zoo. Fischback didn’t set out to be an environmental sustainability specialist; she holds a B.A. in communications and public relations from Washington State University. It wasn’t until after college that she discovered a passion for environmental issues, through reading books and watching documentaries about the urgency of climate change. “I grew up in Central Washington, where environmental awareness was not part of the culture,” Fischback said. When researching master’s degree programs, Fischback discovered that most in-state schools offered environmental science, not environmental studies. She chose Evergreen’s Graduate Program on the Environment for its unique interdisciplinary approach. The flexible, evening degree program enabled her to study by night and to prepare for a career change by day. She embarked on a series of four part-time internships, where she gained concrete experience in the environmental field and applied what she was learning in class. “MES Assistant Director Gail Wootan was great at finding internship opportunities and jobs for students through a blog and social media connections,” Fischback said. In September, with her sustainability plan under review by PDZA’s green team and leadership, Fischback was packing her bags for her postponed graduation trip to Europe. Upon her return, she’ll wrap up her work on the zoo plan, then resume networking and interviewing. She is optimistic that her MES degree and environmental work experience, including writing the PDZA sustainability plan, will lead to opportunities to have an impact, possibly by developing future sustainability plans. Cannon in the museum at Intel’s Jones Farm Campus. Photo by Shauna Bittle ’98. Christen Cannon starts her workday at Intel’s Hillsboro, Oregon, location at 6 a.m. with a Web-conference meeting connecting software engineers scattered across Intel sites in Europe. She provides a demo of a new peer-to-peer learning initiative that works to facilitate a technical learning community on social enterprise software. Using a combination of forums, blogging, social media, and gamification of learning, the platform seeks to map internal technical knowledge and vital expertise across a group of 5,000 software services technical employees at 32 sites around the globe. The rest of the day unfolds in a whirlwind of activity: recording technical presentations, creating a web-based training, and meeting with a principal engineer to discuss objectives for a new learning series. At the heart of every task is the pursuit of how best to create a culture of learning that breaks through silos and connects employees across the company. Soon after supporting the Women in Leadership program, Cannon was brought on to support technical training for the software services group. It wasn’t long before she was piloting the team’s first social learning initiative for technical knowledge sharing. Before transferring to Evergreen, Cannon spent two years in AmeriCorps VISTA (Volunteer in Service to America). She was determined to find a college where she could combine theory and practice the way she had as a VISTA volunteer. She also wanted to study and synthesize her diverse areas of interest: technology, philosophy of education, and sociology. “Evergreen was the place where I could be on the edge of a question, build things, and see immediate social impact,” she said. The ability to negotiate with dissenting opinions, to collaborate effectively, to bridge theory and practice, to stay comfortable with ambiguity, and to innovate every step of the way are hallmarks of an Evergreen education. These abilities serve me well in a rapidly changing environment like high-tech. While at Evergreen, Cannon completed programs and an independent learning contract that covered all of these and other subjects. In addition, a part-time job at the YWCA involving STEM (science, technology, engineering, and math) education provided another opportunity to put into practice what she was learning at school. In late September, Cannon began a new internship at Intel—this time as a graduate intern. She is enrolled in Oregon State University College of Education graduate program, where she plans to study digital pedagogy and continue to create tools for community learning.